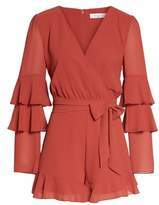 Flirty and fun, this ruffle-hemmed romper features a faux-wrap bodice, drapey waist sash and even more frills at the airy bell sleeves. Style Name:Ali & Jay Silverlake Ruffle Trim Romper. Style Number: 5564213. Available in stores.